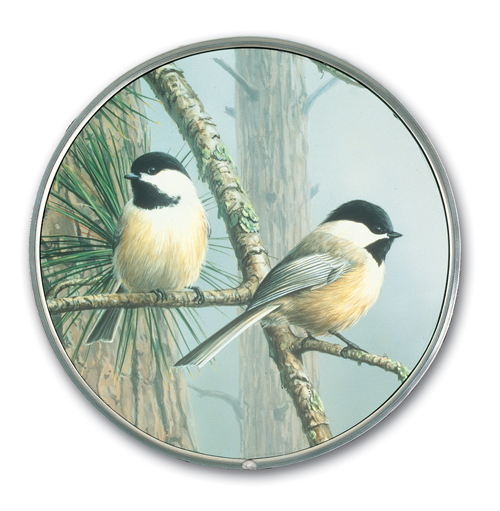 Called hardy, smart, restless, industrious and frugal by John James Audubon, the Black-Capped Chickadee (Parus atricapillus) is a welcome visitor in Canada and the northern United States, as well as the State Bird of Maine and Massachusetts. The Chickadee got its name from its distinctive vocalizations, "chickadee-dee-dee" being the most recognizable. Slight variations in the cheeps and twitters can convey an alarm call, a contact request, or even identifying information about a particular bird or flock. The artwork of the award-winning Hautman brothers, Jim, Bob and Joe, has been featured in the Oval Office, the Smithsonian Museum, and on more than 40 state and federal stamps. The only brothers ever to win the Federal Duck Stamp Contest, they are currently working on a series of Endangered Species Stamps for the United Nations. James Hautman brings a love of animals and and understanding of the natural world to this talented representation of the indomitable Chickadee and the peacefulness of his habitat.